The English Church, 1868, rebuilt 1891; the original designed by Arthur Billing (1824-96). Town Square, Meiringen, Switzerland. This little Gothic gem was built in 1868 for the Rev. C. J. 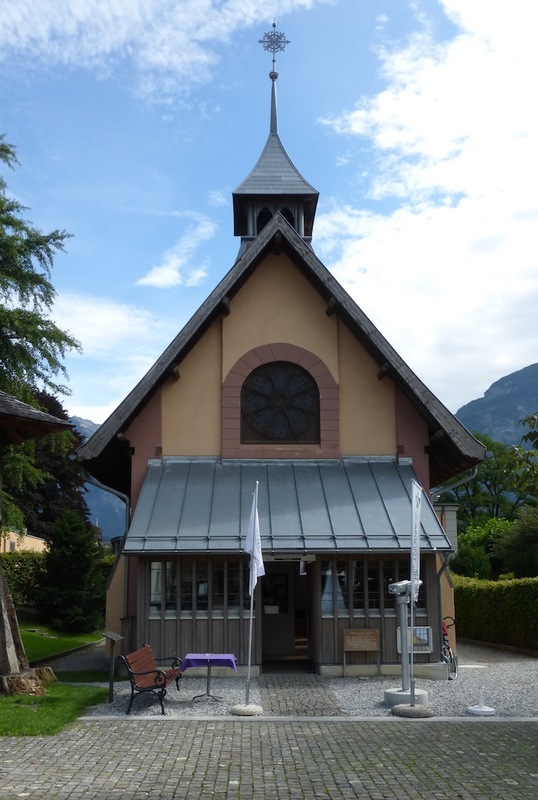 May, who had been chaplain to the British in this popular Alpine resort for nineteen years, to replace an earlier one "which was found to be too decayed to admit of restoration" ("Reuter's Telegrams"). The architect is given in this source as "a Mr Billing, Tooley Street, London." This is most likely Arthur Billing (1824-96), partner of Arthur Shean Newman (1828-73), who practised from 185 Tooley Street, London Bridge. Billing came from a whole family of builders and architects, and was the brother of John Billing of Reading, pupil master to Philip Webb during 1849-52; he himself had been an assistant to Benjamin Ferrey (see Rycroft, and "Arthur Billing"). 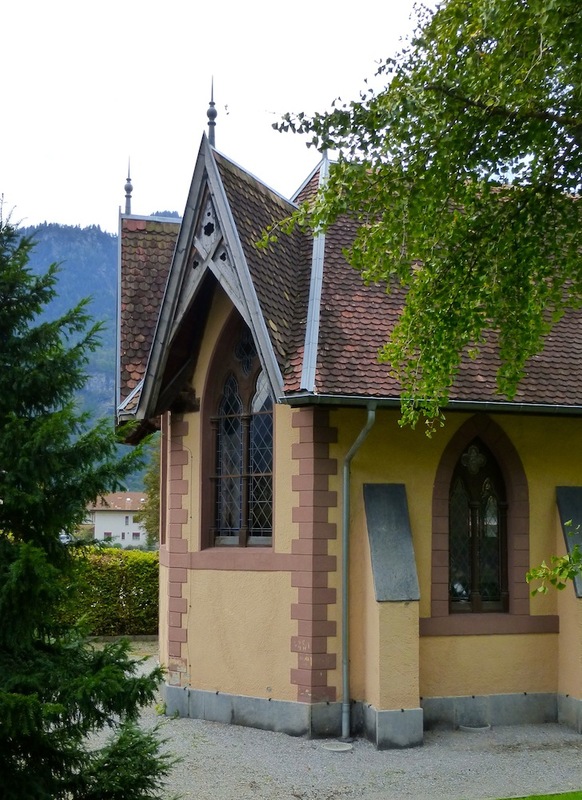 Designing this little Gothic Revival church would have been a pleasant exercise for him. The church was built on a site given by M. Edourd Baud, proprietor of the Sauvage Hotel (now the Park Hotel du Sauvage), beside his hotel's garden — the edge of the hotel building, painted the same yellow ochre colour, can be seen on the left of the photograph above. It was dedicated on 2 August of that year. The Queen herself sent 1,250 francs for the finishing of "the beautiful new English church," and a further £200 was solicited to complete the work ("Reuter's Telegrams"). Left to right: (a) West entrance (now with lean-to porch). (b) View of the north-east corner, with one side of the gabled east end. 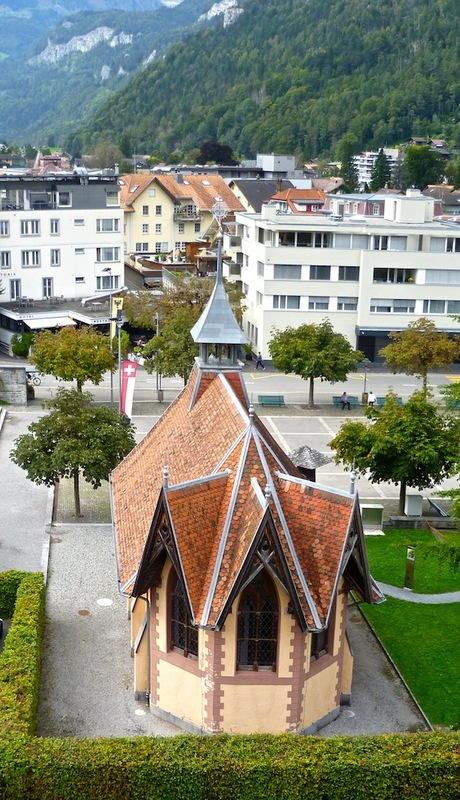 (c) View from above (from a hotel window overlooking the church). The church has undergone some changes over the years. It was one of the few buildings to survive the first of two devastating fires to hit Meiringen. That was in 1879. But it succumbed to the other, in the autumn of 1891, and had to be rebuilt on its old foundations. Although the main part looks the same (including the tower), the unusual triple-gabled east end may date from that time, since this is not seen in an old photograph of it (see "The English Church"). The first church service in the rebuilt church was held by Reverend Dr. J. Payne in 1893. The lean-to porch looks like a much more recent addition. 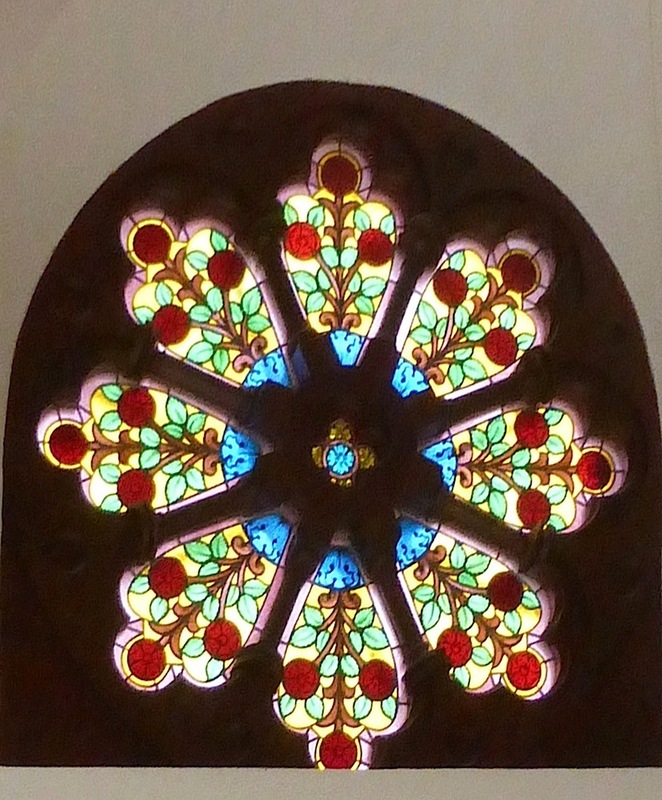 Left to right: Attractive rose window, with (perhaps) Alpine roses. 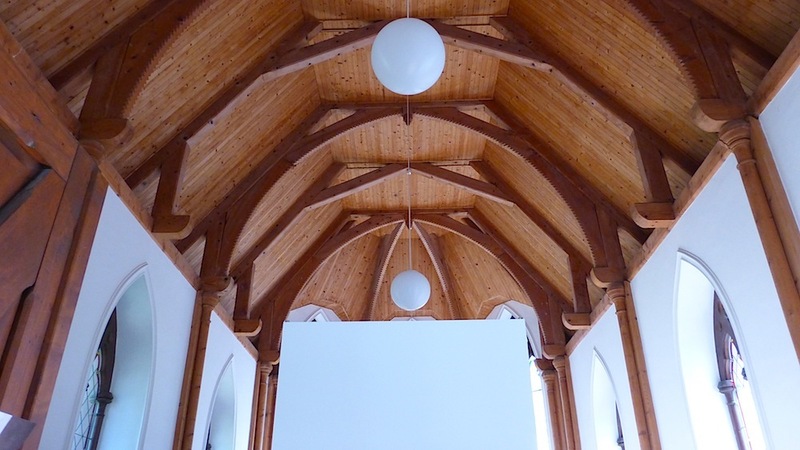 (b) Lovely, not too elaborate, hammer-beam roof. This looks recently restored. 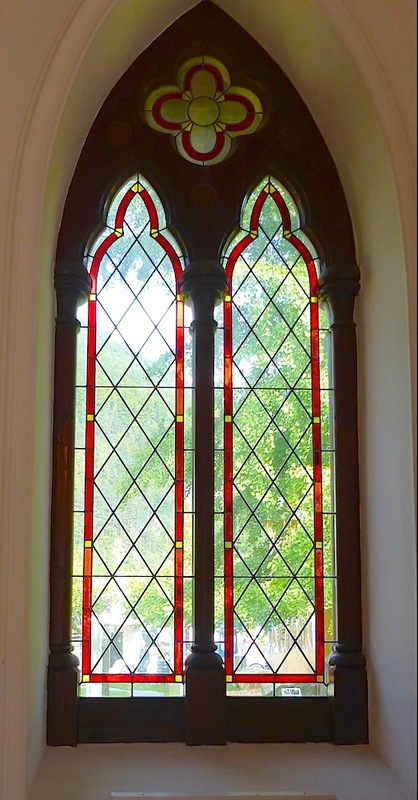 (c) Side window with quarries, red border and matching quatrefoil above. The main part of the church is bright and airy, lit by handsome windows, and with a particularly splendid roof. From these features it would seem that the interior was very pleasant, but is hard to visualise it now because it has been deconsecrated and is used as an exhibition space: partitions have been inserted, and of course the church fittings have been removed. The Rev. John William Horsley, who held the summer chaplaincy at the church for many years. Source: Horsley, frontispiece. 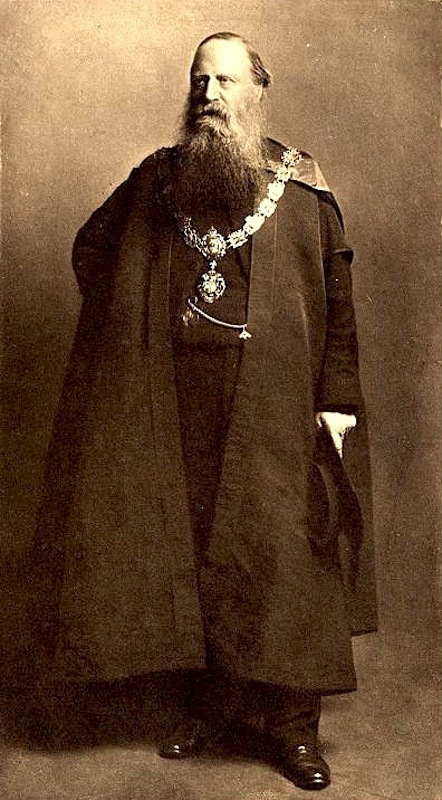 Horsley, who later became Rector of St Peter's Walworth, Mayor of Southwark and Honorary Canon of first Rochester and then Southwark Cathedral, continued to hold his chaplaincy in Meiringen, and bring out his own parishioners and others, for many years. In this way, he explains, he introduced "more than a thousand friends from all parts ... (most of them for the first time) to this land — the best playground, and the schoolroom of Europe." He adds that he has become "an expert in and a lecturer on the Bernese Oberland, a member of the Swiss Alpine Club, and a sort of Consul for Meiringen in England" (150). Such was his enthusiasm that he ended this part of his reminiscences with a long poem about the place, enthusing over the local scenery and including in the refrain a rousing "Hurrah for Meiringen!" During this period the church maintained a connection with royalty: Queen Mary visited it in 1903. The church still keeps its association with England. A popular Sherlock Holmes Museum is housed in the basement area, since the church is near the Reichenbach Falls, where Holmes and the arch-villain Moriarty fall (supposedly) to their deaths in "The Final Problem." Holmes would be resurrected later, by popular demand. The town square area between the church and the main road also holds memories of those famous Victorians who visited and indeed helped to popularise Meirengen. It sports an English-looking street sign naming it "Conan Doyle Place," and a splendid seated statue of Sherlock Holmes by John Doubleday (b. 1947), installed in 1988. The square is about to be graced also by a monumental sculpture group of the celebrated Alpine guide, Melchior Anderegg, leading a young Sir Leslie Stephen up a rock face in the early years of Alpine mountaineering — a sport that Stephen himself helped to establish. This is by a young contemporary Swiss sculptor, Clarissa Kessler. "Arthur Billing." Dictionary of Scottish Architects. Web. 22 October 2014. Brodie, Antonia. Dictionary of British Architects 1834-1914. Vol. 2, L-Z. London: Continuum, 2001. See p.253, entry for "Newman, Arthur Shean, 1828-1873). "Disaster in Oberland." The Morning Post. 17 February 1879. British Library: 19th Century British Newspapers. Web. 22 October 2014. 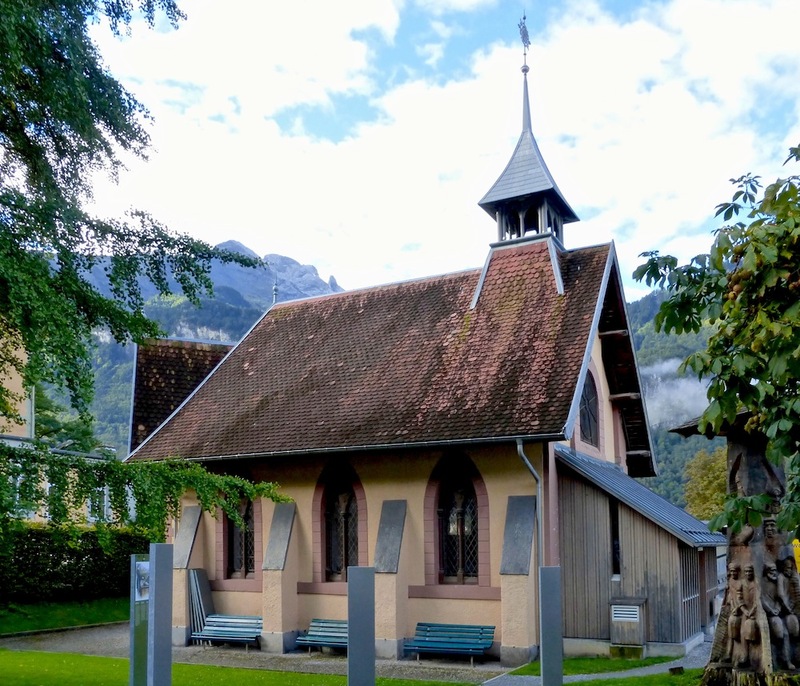 "The English Church, Meiringen." Sherlock Holmes Museum. Web. 22 October 2014. Horsley, John William. "I Remember": Memories of a "Sky Pilot" in the Prison and the Slum. London : W. Gardner, Darton & Co., 1911. Internet Archive. Contributed by Robarts Library, University of Toronto. Web. 22 October 2014. Museum Catalogue, compiled by Guy Marriott. Meiringen, Switzerland: Sherlock Holmes Museum, 2012. "Reuter's Telegrams." The Morning Post. 10 September 1868: 5. British Library: 19th Century British Newspapers. Web. 22 October 2014. Rycroft, Chris. Information about the Billings family of architects sent via Twitter. Web. 3 September 2017.